The Two Rivers Mall in Runda is the biggest shopping mall in Kenya and in the East and Central African region. The complex comprising of an office park, 5 star hotel, and residential apartments is constructed on a 100 acre of land at the heart of the affluent Gigiri, Muthaiga, Runda, and Nyali neighborhoods, and only a few minutes from the several embassies and the UN headquarters in Nairobi, Kenya. The Mall has two rivers traversing through it and that is the inspiration for the naming this whole project “Two Rivers. Upon completion it will provide 850,000 square meters of retail, office, residential, and entertainment space. It will be competing with the nearby Village Market which has been serving most of the expatriates and locals from nearby neighborhoods. Two Rivers project is spread across 40 hectares (100 acres) of prime land and is being undertaken by Centum Investment limited, and will consist of medium density luxurious apartments, office block, a five star hotel and a shopping centre. Centum is the East Africa’s largest listed investment company and trades in both Nairobi Securities Exchange and Uganda Securities Exchange. Majid Al Futtaim Retail –Carrefour (“MAF Retail-Carrefour”), the second -largest retailer in the world after WallMart, has already signed a lease agreement with Centum for retail space at the mall of 110,000 sq Ft. The mall which is estimated to cost close to Sh15.1 billion will be built in phases by Aviation Industry Corporation of China (Avic) with first phase expected to be complete by October, 2015. Avic is the main contractor and has also invested Sh6.4 billion in the project for a 38% stake in the mall. The development will be managed by a subsidiary of Centum called Athena properties which specialises in property development and management services. The Mall will provide state of the art security systems in and out of both development and individual buildings, and has CCTV for surveillance, and a police post. It will have 24hr medical and emergency facilities that will have a standby ambulance and fire fighting service and provision of specialist health clinics. An ample parking will be available, and proper traffic design will ensure that vehicles in and out of the building are well controlled, and that the pedestrians’ movement will not hamper vehicular traffic. The Mall is can be accessed either through Limuru road, or from the Northern By-pass and is in close proximity to leafy suburbs of Westlands, Runda, Lavington, Loresho and Gigiri. It takes only ten minutes drive from UNEP headquarters, U.S and Canadian embassies and about 20 minutes drive from Nairobi CBD. There has been a growing demand for retail space in Kenya driven by the growing middle class in the country and relatively unsaturated retail market. The investment has also been encouraged by the positive economic growth the country is currently experiencing, foreign interests from international brands, and further strong growth expected in the future. 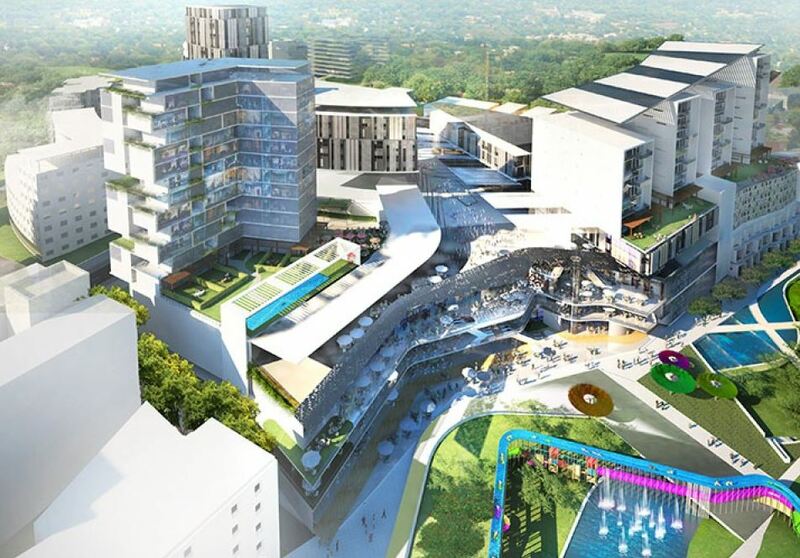 Once complete Two Rivers Mall, will unseat Garden City, a 32-acre mixed use development on Nairobi’s Thika Highway, to become the largest mall in Kenya.